Quiet is good. There is nothing bad to report and everything seems to be stabilizing. I am preparing to start finishing up the second episode of Kingdoms. This will have Max and the Dumpy Family make their premier inn the series. I'm excited to showcase them and their family system. I got an UTH and they seem to be more active and alert. Fin the Betta Fish is doing a little better too. The Skinks will be back in episode 3 and it will have the footage of some interesting activity from the Skink Dynasty. These Skinks may get in the history books because they are behaving differently then most thought of them. These Skinks are more unknown than the other Skinks of their family. The baby Cope's Gray Tree Frogs are doing great but one baby is much bigger then the others. The Bumblebee Millipedes and Canyon Isopods are doing well. Everyone is great right now so hopefully things can stay like this for a while. Just a small update for you. There will be more when the next episode is being completed. I wanted to let you all know that I got the footage of my skink eating blueberries tonight! I saw how he eats them and I was floored. He actually attacks them but he knows they are a fruit. It's so unbelievable to see. Not only did I record this but I FINALLY saw the Squirrel Tree Frog eat!! And while I was filming Pharaoh eating blueberries Florence was croaking right above him! I was in the right place at the right time tonight! I don't have the clips off my camera yet so I will have to get a picture to post. So tomorrow I am going to give Pharaoh different food to try. Like strawberries tomorrow I will see if he eats them. This would be really cool to document. Then I will try carrots and so on. Kingdoms Episode 2 is waiting on the Dumpy Family to eat the Black Soldier Flies and I'll get them on film but so far no luck. So we will just have to wait a little bit longer. So I got a new job and some changes are necessary so I can still keep everyone updated on the animals and their stories. So I think I will coordinate the update on them during one of the days I feed them. So the Five Lined Dumpy Family eats Tuesday and Thursday. This is just an announcement so next week I'll start this routine. Episode 2 is done with filming and I'm editing a little bit but it's about to be finals week so it will probably get done after finals week. It should be faster once the summer break comes. The Dumpy Family looks very good and I got new breathtaking footage from inside the enclosure as Max leaps around the from the plants to dive-bomb prey. There are some old clips but there will be a new perspective from the Dumpy Family in this episode. I am taking my native toads to the vet and will take a stool sample from Max so we will see how she's doing. I'm really excited to put this episode together because the clips looked amazing filming them. 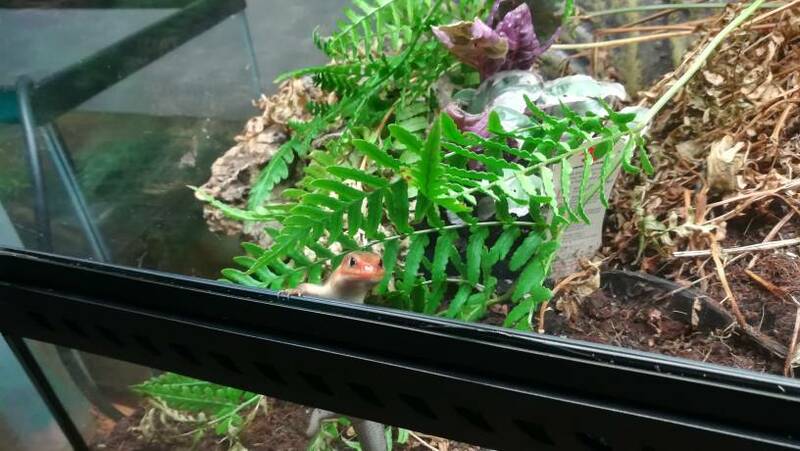 The Skink Dynasty is doing well. One adult Snail has survived so far and the Skinks are thriving. The Squirrel Tree Frog (Florence) has finally been able to adjust to being captive and he's eaten a few times in front of me. He's croaking a lot too. I got this and the purposed scientific discovery coming in the third episode. Pharaoh confirmed he ate fruit. I saw the strawberries were moved around and I know it was him. It's cool that a lizard who isn't supposed to eat fruit does. Even lizards have a sweet tooth! Episode 3 will have some great footage of Pharaoh and Florence being the stars. They truly make the night special and will make this upcoming video very memorable. So there is a bit of a calling war going on in the hallway because now that Florence is comfortable he calls every night between 1-6 times a night. The Dumpy Family who is next to him do not like loud noise so they croak in protest of Florence. So then he thinks it's a competition so he calls back. He is 1/3 their size. He's such size to them but he knows he's safe so he calls. 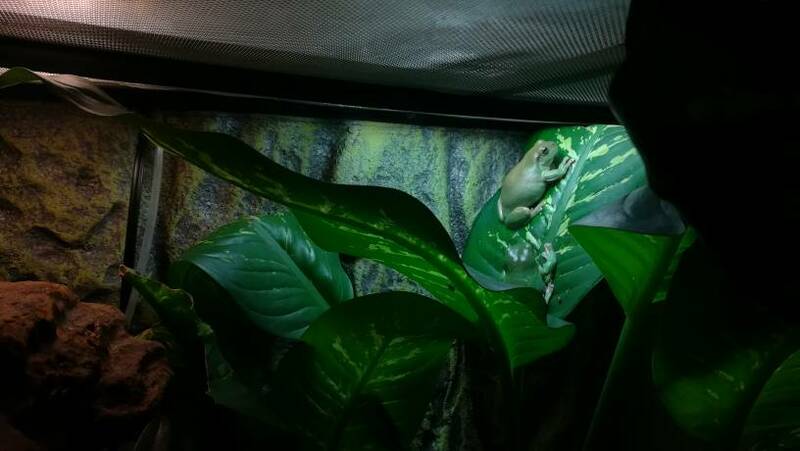 I honestly can't wait to see if one of the baby Cope's Gray Tree Frogs are a male because then they will be calling as well and it will be a noisy hallway with 3 species of frogs and 2 species of crickets. It will be a calming and welcomed noise too. I think it's funny and cool that the Skink Dynasty and Dumpy Family can communicate back and forth. It's a very fun night when they both are active and calling. I will be getting a female Squirrel Tree Frog for Florence so he's going to probably call more once she's in the Skink Dynasty. That's in August though. Maybe in episode 3 I will be able to get the Frog Calling War on video. Are you excited to get updates for the Five Lined Dumpy Family earlier in the week? Do you have frogs or amphibians or reptiles that communicate with each other in different setups? Last edited by AAronCap; 04-15-2019 at 10:55 PM.